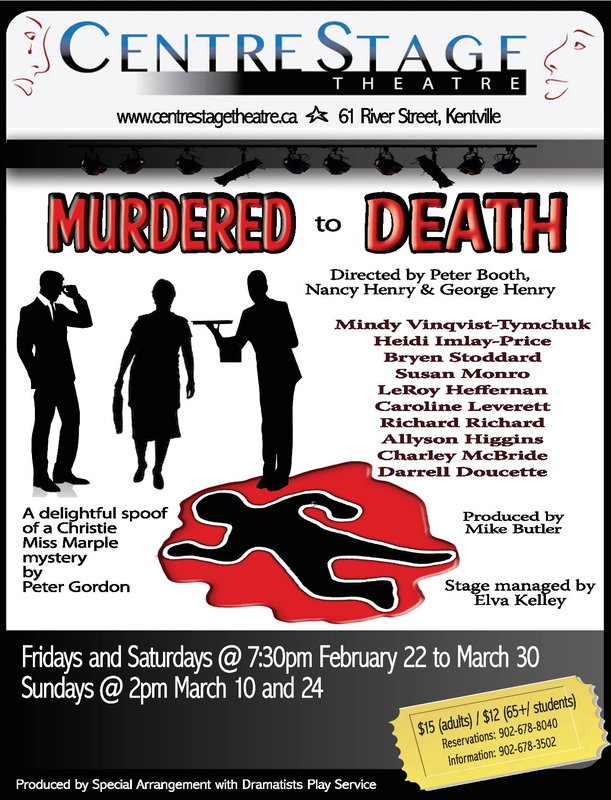 CentreStage brings a delightful Miss Marple spoof to the stage with Peter Gordon’s Murdered to Death. The play introduces the inept and bungling Inspector Pratt, who battles against the odds and his own incompetence to solve the murder of the house’s owner. It soon becomes clear that the murderer isn’t finished yet; will the miscreant be unmasked before everyone else has met their doom or will the audience die laughing first? 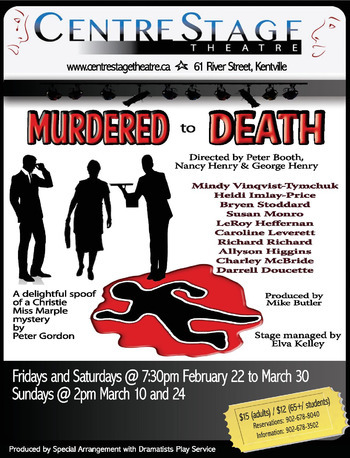 Murdered to Death is directed by the intrepid trio, Peter Booth, George Henry and Nancy Henry. The producer is Mike Butler. The cast in order of appearance: Mindy Vinqvist-Tymchuk, Heidi Price, Bryen Stoddard , LeRoy Heffernan, Susan Monro, Caroline Leverette, Richard Richard, Allyson Higgins, Darrell Doucette, Charley McBride. The crew is Elva Kelley and Kathy Walker. The featured artist is Ann Kenny. Adults $15; seniors/students $12; children, age 12 and under, $5. Cash or cheques only. Reservations 902-678-8040 (held till 15 minutes before showtime).